Betws-y-Coed is today in the Snowdonia National Park; the Afon Llugwy joins the River Conwy to the north of the settlement. A little way outside Betws-y-Coed on the road to Capel Curig is Miners' Bridge, which spans the Afon Llugwy. The famous Swallow Falls is further up the same river valley. Whilst this albumen print has no date the picture was probably taken in 1890 or before as it is mounted on a board which has an image from 1890, that is more readily dateable, on the reverse. Lead mining was a local industry and local miners would use this steep ladder over the river as a short cut to get to their place of work. We took the road to the right, up through the village in order to visit the Swallow Falls, passing on our way the Miner's Bridge, an old wooden structure across the river, and soon reached this beautiful cataract". Miners' Bridge and Swallow Falls, in one direction, and Fairy Glen and Conway Falls in another, are typical "bits" that are entrancingly beautiful". "But grand indeed is the site of these ravines when rain has plentifully fallen over the mountain region, for the dreamy trickle of the stream is changed into a loud roar, and the luxury of the quiet motion to the furious dash and foam of the impetuous torrent". This would have been a favourite spot for both photographers and artists alike and the second image is from a painting by Henry Hadfield Cubley, a Newark born artist who lived in Matlock Bath, Derbyshire for a number of years. 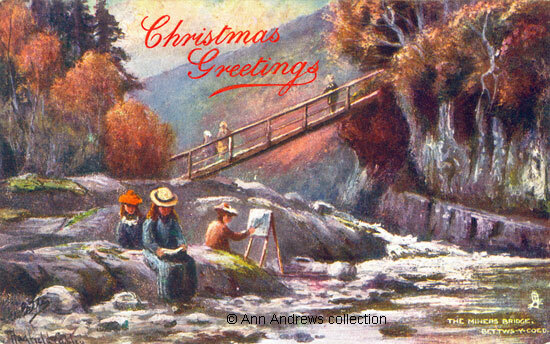 The picture shows his wife, who was also an artist, working at an easel and his two daughters. It seems likely that the original was executed at the very beginning of the twentieth century. 1. "Bettws y Coed. 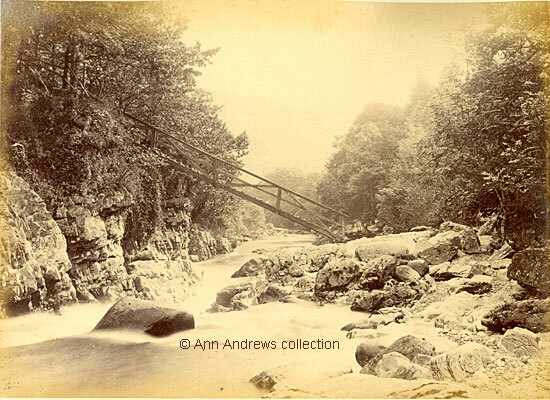 The Miner's Bridge", probably taken by __ Bedford, though Bedford might have been the publisher. Albumen photograph mounted on card. 2. "The Miner's Bride, Bettwys-y-Coed". Published by Ralph Tuck & Sons "Oilette" [Regd,] Postcard 1683. Art Publishers to their Majesties the King and Queen "Picturesque Derbyshire". Unused. Both images in the collection of, provided by and © Ann Andrews. "Wellington Journal", 2 June 1888. Reminiscences of a Tour in North Wales. Written by someone who called themselves simply "The Tourist". "Cardiff Times", 10 August 1889. Where to go for a holiday. Some beautiful Welsh resting places. North Wales. There is a short biography of Mr. Cubley in the Matlock section.